A Denver food place is serving up a new dish. this is not fair at all. What does diamond back taste like? Is it expensive? that is a really cool sign..
id like some BBQ right about now. Mugla Marmaris Bodrum Fethiye Dalaman Dalyan Ortaca Ula Akyaka Datca Milas ta Satilik yazliklar evler arsalar araziler. Şimdi Türkiyede konut almanın tam zamanı bizimle hemen irtibat kurunuz. Real Estate in Turkey, property for sale Villas Houses Lands Garden Houses. Great sign! 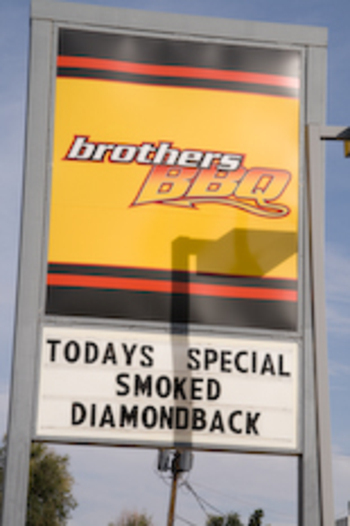 Nothing like some delicious Brothers BBQ with a little D-Back whooping on the side! Steve ~ what is not fair? The sign or the weather? I only photograph what I see. As far as the weather, last time I checked our boys have to show up too! Krystal, this isn't playing fair!